William P. Hobby - Lambert-St. Louis Intl. QLA-All Airports - Lambert-St. Louis Intl. The expansive view lets you see the curvature of the earth, and stretches seemingly from the Atlantic to the Pacific. It’s a memory you won’t soon forget, and it’s not just the vista from the top of the iconic Gateway Arch that will be etched in your memory bank, either. The ride to the top in one of the most unique elevators on the planet is just another part of the fun. Welcome to St. Louis, Missouri, the largest city in the Great Plains and home of the impressive vantage point. It's a city where blues music, baseball, and beer have a special place, and where the history of westward expansion in the United States can be felt. Whether you're exploring the gorgeous Cathedral Basilica of St. Louis or saying “hello” to wild beasts at the St. Louis Zoo, you'll enjoy the city's unique Midwestern vibe. Using Travelocity to purchase vacation packages in St. Louis, MO and bundling your flights and accommodations at the same time is the best way to find a cheap vacation in St. Louis. Plus, you save all the aggravation of planning a getaway. We’ll take care of the details so you can focus on the fun. Hyatt Regency St. Louis at The Arch – With the city’s most notable landmark just outside the lobby door, the Hyatt Regency is in a prime location for exploring the area’s attractions. 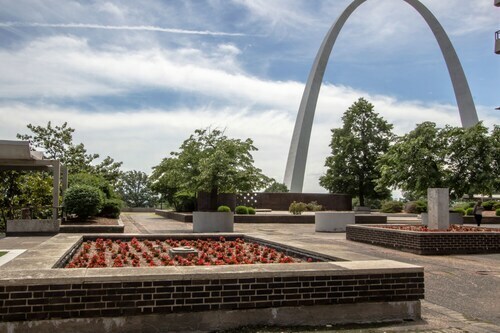 Visit the Gateway Arch in the morning, take in an MLB Cardinal’s day game at Busch Stadium just a handful of blocks away, then head back to the hotel for dinner at Ruth’s Chris Steakhouse, RED Kitchen & Bar, or the Brewhouse. 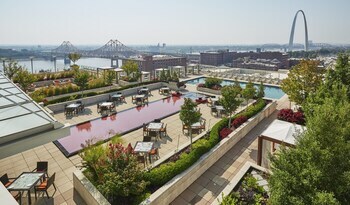 The Westin St. Louis – If you are planning to visit while your hometown team is battling the St. Louis Redbirds, the Westin is the perfect place to make your home-base. Not only is it right across 8th Street from Busch Stadium (in case the game should go past the bottom-of-the-ninth), the comfortable bedding and in-room spa will have you feeling like an all-star. And, the Clark Street Bar and grill will help your postgame party rival a World Series celebration. 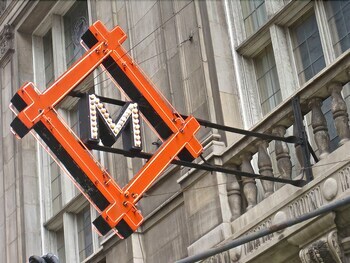 HoteLumiere at the Arch – Don’t roll the dice on inferior accommodations. Instead, live it up like a high-roller at the HoteLumiere, right next to the Gateway Arch. With an on-site casino offering slots, table games, and a poker room, Lady Luck is sure to be on your side. The newly renovated guestrooms boast an ultrachic décor, plush bedding, and spa-inspired amenities. The Chase Park Plaza – As hip as it is historic, the Chase Park Plaza delivers unparalleled elegance. After a day discovering the city, return to the Plaza for a refreshing dip in the Mediterranean-style outdoor pool, a rejuvenating treatment at the Aveda Spa, or take in a film at the on-site cinema. 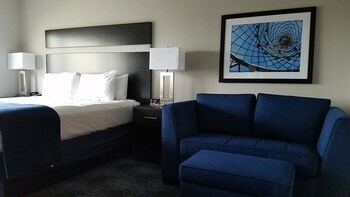 Once your evening has concluded, make your way to your luxurious guestroom where modern décor, graceful lounge spaces, and sweeping city views await. Sample beers at the Anheuser-Busch Brewery, watch a Cardinals baseball game in the summer at Busch Stadium, or tour the Museum of Westward Expansion (part of the Jefferson National Expansion Memorial). Have your mind blown at the City Museum, a one-of-a-kind attraction that features everything from obstacle courses to tunnels. Head to the vast Forest Park to picnic, golf, or bathe under the sun. Once night falls, take in a show at The Fabulous Fox Theatre, grab some St. Louis-style ribs in Midtown, or party the night away in the Delmar Loop. Choices abound in this town, so consider the sights you'd like to see as you search St. Louis hotels. From Soulard Mardi Gras to the Best of Missouri Market in October, St. Louis is all about having a good time, much like you. St. Louis Bluesweek in May, Fair St. Louis on the Fourth of July, and Budweiser Taste of St. Louis in September are just a few of the city's fun events to partake in. As you search for vacation packages in St. Louis, look up your travel dates to see if any events are occurring. To make the most of your trip, start looking for discounts on St. Louis vacations on Travelocity early. 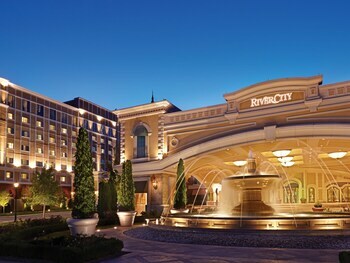 You'll find great deals on St. Louis car rentals, flights, and hotels. You’ll save enough money to send your vacation into extra innings when you use Travelocity to book St. Louis package deals by bundling a hotel and flight together. This 18-story Hyatt Regency hotel is 4 blocks from Busch Stadium and within a mile of Edward Jones Dome, Scottrade Center, Laclede's Landing, and the America's Center. 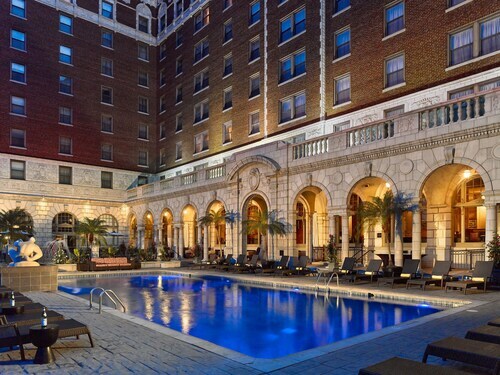 Located in the fashionable Central West End of St. Louis and close to Washington University and St. Louis University, this hotel is surrounded by shops, restaurants, mansions, and Forest Park. It's also 4 blocks from Barnes Hospital and 1 mile from museums and the zoo. 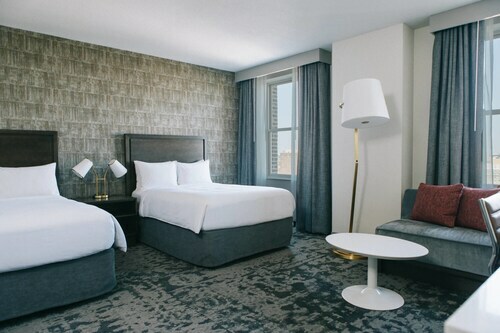 This 29-story St. Louis hotel is 4 blocks from Busch Stadium, 6 blocks from the Edward Jones Dome and the Lumiere Place Casino, and less than 1 mile from Scottrade Center, Laclede's Landing, and America's Center. 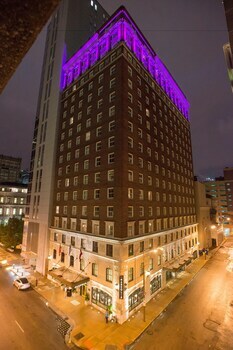 Located in Downtown St. Louis, this hotel is within a 10-minute walk of Old Courthouse and Busch Stadium. Gateway Arch and Dome at America’s Center are also within 15 minutes. 8th and Pine Station is 8 minutes by foot and Convention Center Station is 9 minutes. Located in Central West End, this hotel is within a 10-minute walk of Forest Park and Barnes Jewish Hospital. World Chess Hall of Fame and Cathedral Basilica of St. Louis are also within 15 minutes. Central West End Station is 6 minutes by foot. Located downtown St. Louis, this 7-story hotel is 4 blocks from the Gateway Arch, 6 blocks from Busch Stadium and America's Convention Center, and less than 1 mile from Laclede's Landing and the Scottrade Center. 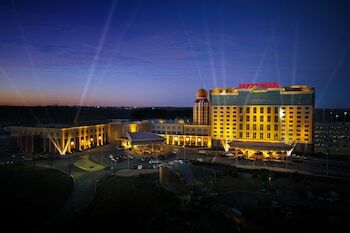 Situated near the airport, this hotel is 1.3 mi (2.1 km) from Hollywood Casino Amphitheatre and within 9 mi (15 km) of Historic Main Street and Lindenwood University. 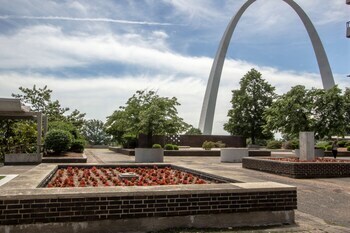 Family Arena and Gateway Arch are also within 25 mi (40 km).